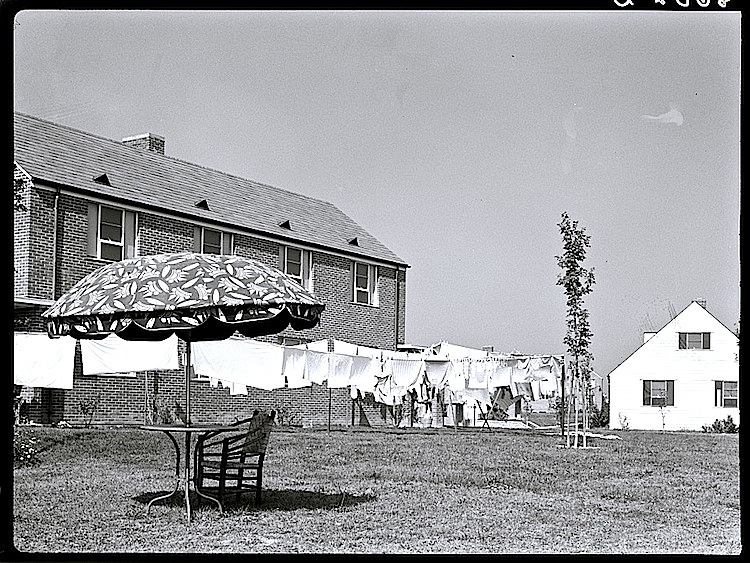 Greenhills, Ohio, October 1938, by John Vachon for the U.S. Resettlement Administration, via Library of Congress Prints and Photographs Division.
. . . The building of these towns provided much needed jobs for those in the trades (brick layers, plumbers, carpenters, electricians, etc. ), as well as people not in the trades who worked at clearing land, digging trenches, etc.
. . . The most important aspect of these towns was to provide low income families with affordable housing to raise their children in and a safe environment with access to large open “green” spaces. Pathways were created in each section of homes to connect the sections to each other, as well as provide a pathway to the Village center. There are more Library of Congress photos of Greenhills here. *The first residents moved in in April 1938. I love the smell of laundry –especially bedding — after it’s been drying outside! I love that tiny little table with the big umbrella and the single chair. I can imagine a woman who has gotten her children off to school and the laundry hung up sitting there and enjoying a second cup of coffee (and probably a cigarette).